Follow these steps to get your photos added to your Google Photos library. Don't worry, you can change this later. 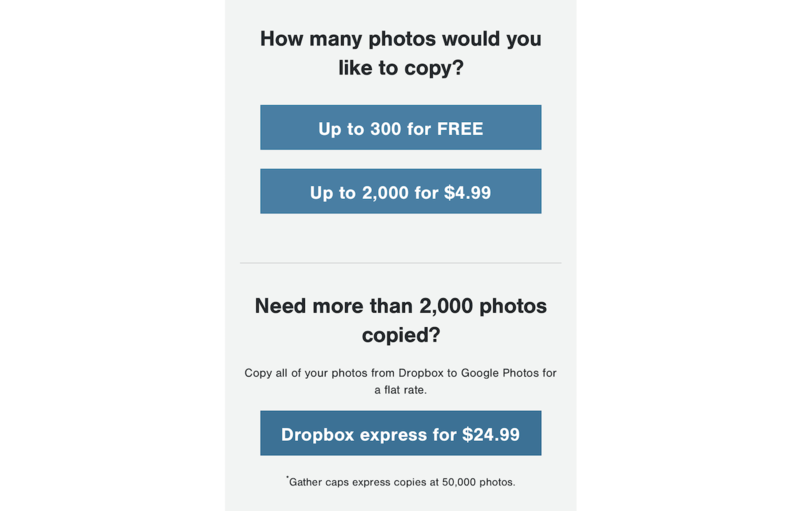 Choose to copy up to 300 items for free, up to 2,000 for $4.99, or use our express option copy of all your Dropbox or Flickr photos for $24.99. Please note that Gather caps express copies at 50,000 photos. 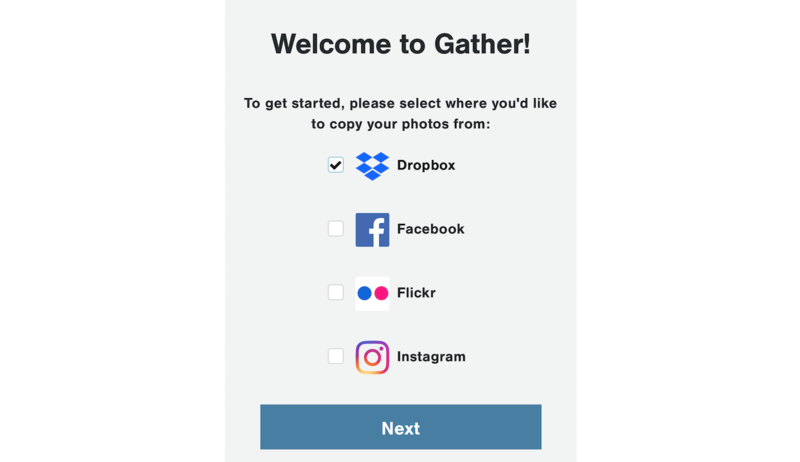 This gives Gather permission to add photos to your library. This permission will expire a few hours after your order is complete. Signing in to each of your accounts gives Gather permission to retrieve photos from those accounts. This permission will expire a few hours after your order is complete. 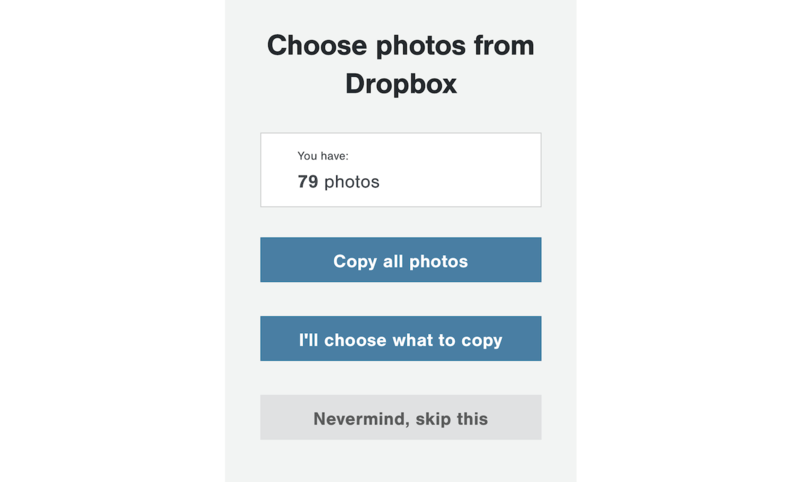 Now you can choose which photos to copy. 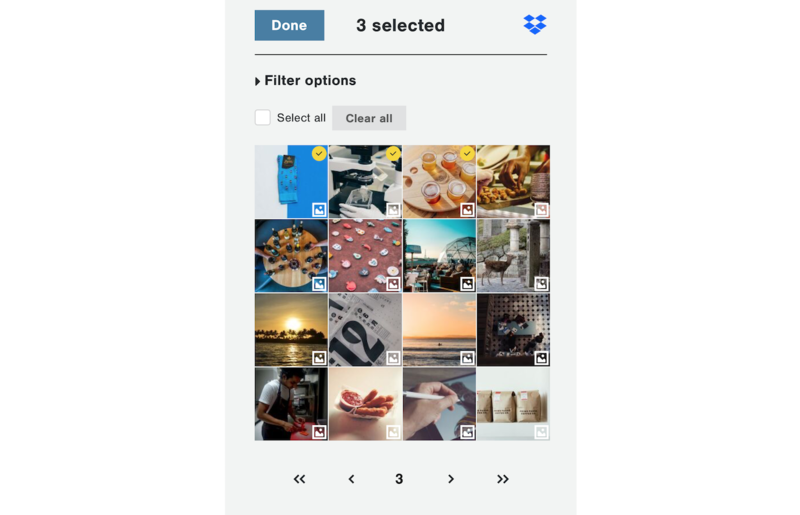 If you choose to select specific photos, you can browse and/or use filters to make your selection. 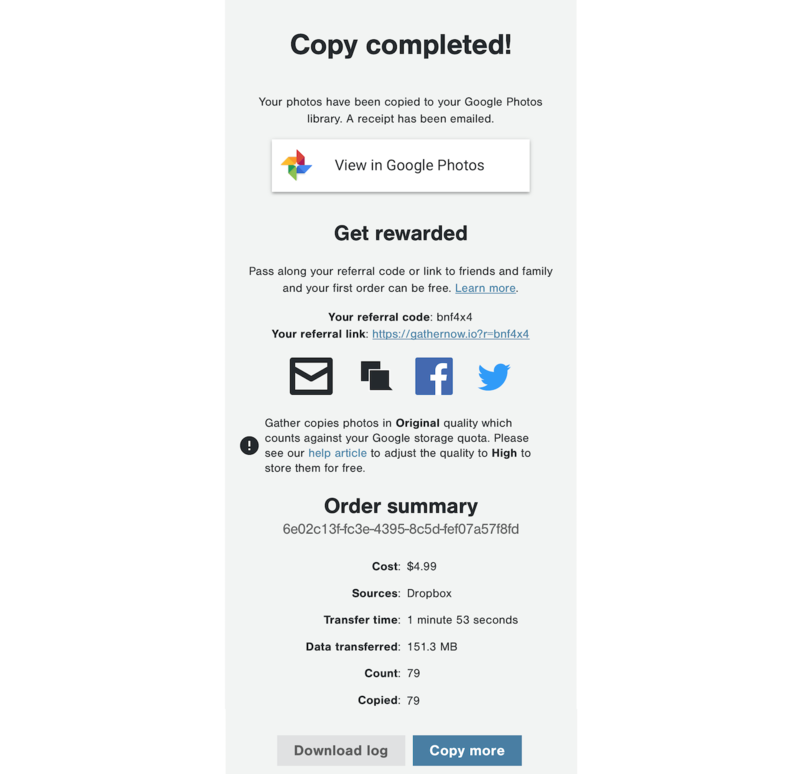 You can optionally view the status of your order as your photos are being copied. If you leave for any reason, not to worry, Gather will keep right on copying. 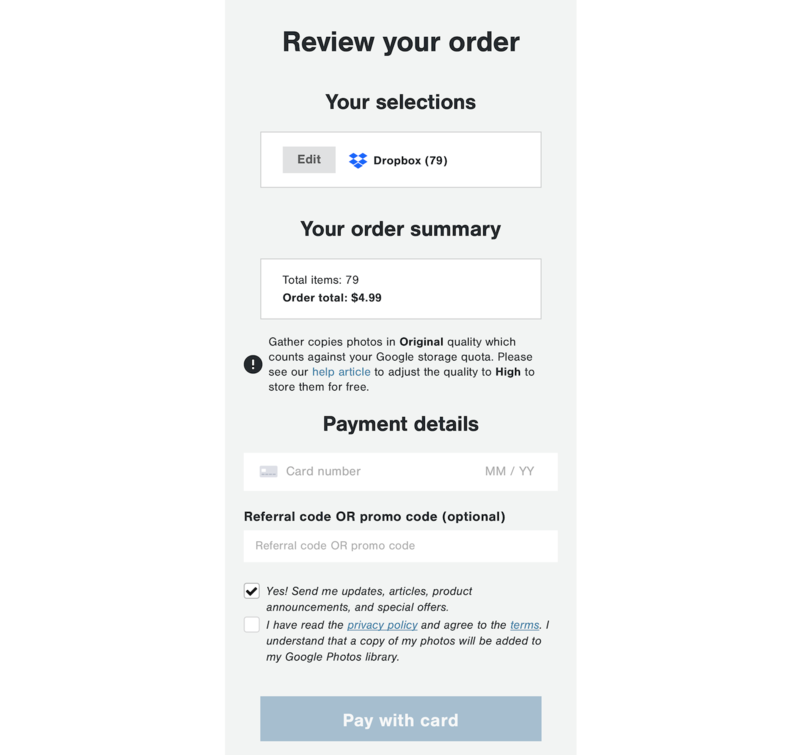 Gather will send an email when your order is complete and will also send a receipt for paid orders. There are a few options to share your experience and/or earn referral rewards. Click on the Download log button if you'd like a CSV file with all of the details of the photos that were copied to your Google Photos library. Here are details on the photo formats we support and on our pricing. Finally, as an added convenience Gather automatically creates an album in Google Photos with all of the photos that were copied for your order.